100 Men Who Give A Damn Dallas is one of the greatest charitable movements Dallas has ever seen and 100 Men Dallas’ founder, Charles Gillis, is a one of the best men I know. When I learned about the charity I immediately volunteered my time and expertise. 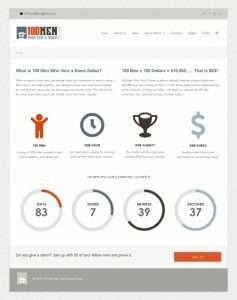 I put together the full marketing gamet (web/creative/social media/print) for 100 Men Dallas in a short period of time and the results were pretty stellar. Charles raised over $10,000 at his first meeting. I was honored to create the branding for this great cause and continue to be a part of it’s future as a founding member and its principal designer.